In the early days of gaming consoles, well before “survival horror” was even a coined term (it started in 1996 with Resident Evil), gamers only got to experience a few select horror games. Some were innovative at the time (like the original Castlevania game) while others came across as a bit cheesy (Friday the 13th, anyone?). There were also the few that mixed them together to create a humorous game to lighten the mood. One of those little gems was a point-and-click video game called Maniac Mansion. 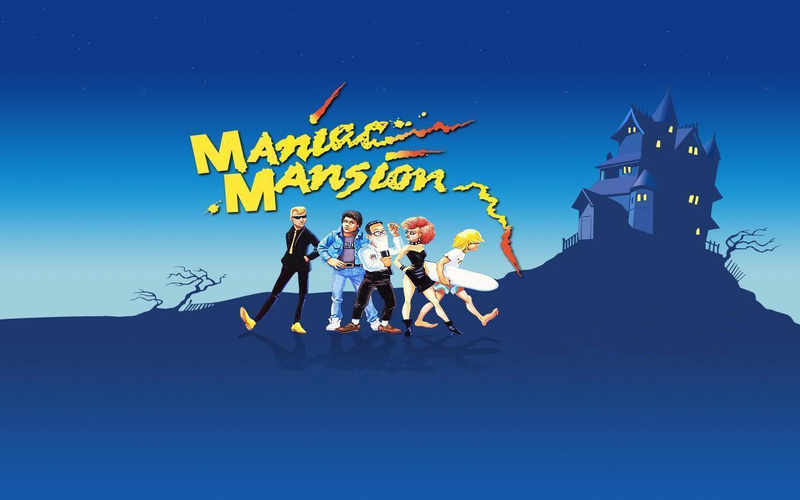 Maniac Mansion is a 1987 point-and-click graphic adventure video game created by LucasArts. Players take on the role of high school student Dave Miller, as well as two additional friends of choice, to explore the creepy Edison Mansion and save Dave’s girlfriend, Sandy, from the evil scientist, Dr. Fred. Featuring a changeable group of six protagonists, the player must solve puzzles, explore the mansion and avoid being killed before they can save Sandy from having her brain removed. Maniac Mansion was released on the Commodore 64, Apple II, IBM PC, Amiga, Atari ST and NES. This isn’t your typical “survival horror” video game. In fact, since it predated many of the tropes gamers are used to seeing today, the horror aspect is a bit tame in comparison. Whereas most video games nowadays rely on defeating horrible monsters or stocking an arsenal of weapons, this game focuses heavily on solving puzzles and exploration. As four villains roam the house hoping to capture you, the mansion itself is the biggest mystery. Each room and area of the mansion (usually) holds some clue to progressing deeper into the house. And which characters you have selected within your group of three determines HOW you will complete the game. Similar to other games of the genre, each main character comes with their own style, attributes and special abilities. These additional traits can be a benefit or hindrance, depending on which special abilities you think you might need. For instance, certain characters can play instruments while others are great with technology. However, one of the interesting mechanics that Maniac Mansion utilizes because of this is the story progression. Not all puzzles can be solved by every character; certain puzzles require specific characters to complete them or they will remain unsolved (like, for instance, musical instruments – see above for aforementioned note). Depending on the progression, the ending may be different. The game features a small selection of endings that will change based on actions taken, clues solved, and the route to complete the game. And if you can believe it for this B-comedy horror game… characters die. The main cast CAN die in the game and they will STAY dead. Usually players will simply be captured and brought to the dungeon, but certain times the game will surprise even the gamer with a quick death. But still… that dungeon… it’s (quite literally) the worst. While this point-and-click adventure may seem only like a cute novelty from the past, it did implement a staple that is still used today in gaming. Maniac Mansion’s co-writer and designer Ron Gilbert created the cut-scene. You know, it’s that cinematic experience or video between levels and moments that push the story forward. 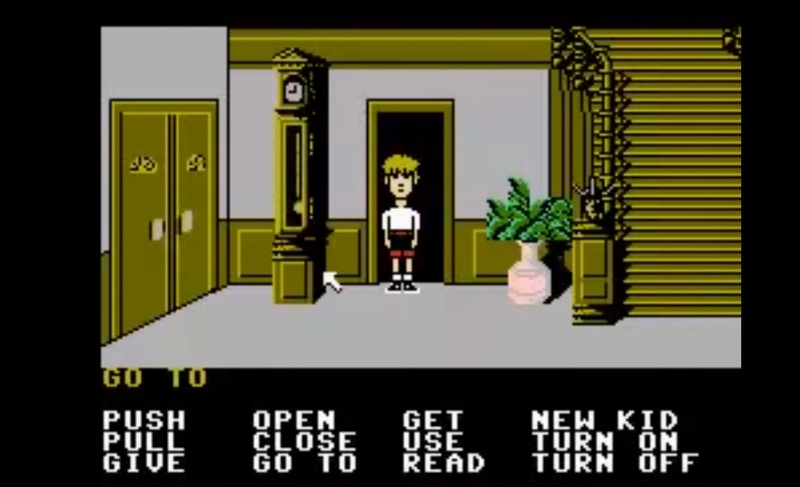 For an early generation game, Maniac Mansion utilizes this technique to forward the story but also takes it one step further: the scene cuts away to a different moment in the house. Based on a time feature, a scene will play out to progress the story and give hints as to the location of the villains roaming the house. One minute you may be walking through the grand foyer and then the next you’ll get a scene with Dr. Fred tormenting Sandy. It’s a fun takeaway and a cool feature for such a retro game. But we can’t forget that Maniac Mansion is from the ’80s. This is such a retro and vintage game, yet it still holds up as an enjoyable time. It’s more for the experience! Turn on some tunes, watch an episode of Stranger Things and then play this light 2D campy, 80s retro-style game. It’s not that long of a story, and if you know what you’re doing you could easily beat it in record time. Maybe even by Halloween!